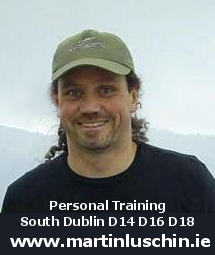 Kettlebell Instructor in South Dublin, Ireland since 2002. He changed career in 2002 after a lifelong passion for fitness and exercise ( competitive long distance, cross country running and triathlon 1990-2010, soccer and track & field as kid and teenager, in between Yoga, Pilates, Tai Chi – a bit Juggling and nowadays mainly a mix of Kettlebells, Pilates, Core Strength and functional exercises i.e. TRX). Martin owned and managed a Fitness Studio – “Fitnecise Studios” in Churchtown Village, Dublin 14, Ireland 2009 – 2015. He and a team, of four other instructors, offered various fitness and exercises classes e.g. Pilates, Yoga, Kettlebells, HIIT (Hight Intensity Interval Training), Capoeira, Circuit Training, Mindful Movement etc.. Various therapists used the studio space to provide injury treatments, diet and nutrition advice and other health and well-being related services. (1) Personal Training with the focus on a combination of Fitness, Health, Well Being & Diet/Nutrition rather fitness on it’s own. He worked as Hard and Software design engineer with a Leopardstown, Dublin 18, based company (S3 Silicon & Software Systems) from 1997 until 2002. In 2002 he qualified as Personal Trainer and Fitness Instructor with the NTC (National Training Centre) off Dorset Street in Dublin City Centre. NLP – Neuro Linguisitc Programming – 2004, NLP Training Institute Ireland. Psychology and the amazing and wonderful workings of the mind, brain.